The CBP is looking for personnel in Puerto Rico. 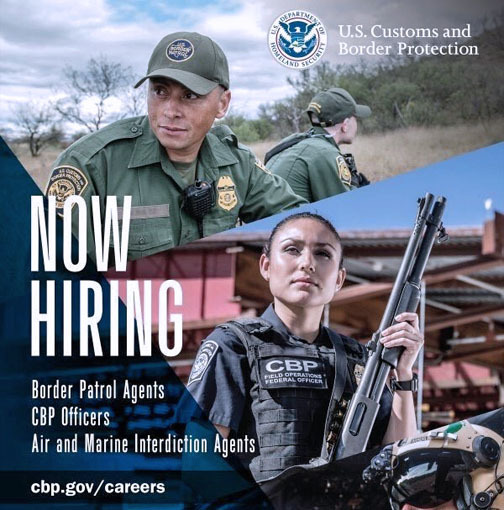 U.S. Customs and Border Protection announced Thursday it is recruiting for positions of border patrol agent, field operations officer, pilots and maritime agents throughout the United States. To apply and answer questions, CBP will have an orientation table at Plaza Las Americas (in front of Foot Locker) June 12-17, the agency said. “As a key component of the Department of Homeland Security’s frontline defense, a CBP officer’s primary responsibility is to detect and prevent terrorists, their weapons, and other threats from entering the United States while facilitating legitimate trade and travel,” the agency said. “This requires enforcing more than 400 laws related to trade, contraband, agricultural pests and diseases, and admissibility of individuals,” the CBP said. An incentive of 25 percent of the basic/locality pay for the first three years is available for certain hard to fill locations. To receive the bonus, the applicant must commit to staying at that duty location for three years. In Puerto Rico and U.S. Virgin Islands there are two open announcements for pilots and maritime agents, the agency said. For more information on current positions, click HERE. Hey Buddy!, I found this information for you: "CBP at Plaza Las Américas to recruit agents, officers". Here is the website link: https://newsismybusiness.com/americas-recruit-officers/. Thank you.